As Bookanistas, we can only recommend/review books that we love, so sometimes it takes a while to find just the right books for our Thursday posts. We have to read a lot. So it's such a relief when I come across books like IMAGINARY GIRLS; I knew within the first few pages that this was a book I would want to recommend. I'd been captivated by the cover when Nova Ren Suma first revealed it, but it doesn't take long, a few lines maybe, before you realize you have something special. Summary: Chloe's older sister, Ruby, is the girl everyone looks to and longs for, who can't be captured or caged. When a night with Ruby's friends goes horribly wrong and Chloe discovers the dead body of her classmate London Hayes left floating in the reservoir, Chloe is sent away from town and away from Ruby. I read IMAGINARY GIRLS almost entirely in one sitting. I was mesmerized by this book. The writing won me over first--so impossibly beautiful and sharp and resonant, every line leaving its mark on you long after you've moved on to the next and the next. But closely tied is the voice, which grabs hold of you from word one and just doesn't let go, not even after you close the book. Chloe is perhaps one of the strongest, most vivid narrators I've had a chance to read, insecure and awkward, flawed and tunnel-visioned in her devotion to her sister--yet not blind to the strangeness of the events around her. In fact, she's more than aware of the abnormality of the life she's sucked into as she reunites with her sister Ruby, a startling character with an intense, free spirit and beauty; and it's Chloe's consuming curiosity that will unravel the threads of Ruby and Chloe's tightly-knit world. But things don't just come undone in one untimely moment. From the very beginning, you know that there's something dangerous lurking beneath the surface--of the reservoir and of Ruby's exterior. And from there, the intensity just doesn't stop. It's not that there's an insane amount of action. There's just this tension that builds and builds as the mystery grows bigger and bigger, and before you know it you're racing through the pages because you have to know what's going on. You just have to--just like Chloe who can't help but dig and dig even though it might mean exposing an uglier side of the one person in the world she loves most. It's such a gripping story. I whipped so fast through this, never a dull moment, but it wasn't the action that drove the pace; it was Nova Ren Suma and her masterful delivery. I don't know that I've read anything like this in a long time. It reminded me a bit of Isabel Allende's House of Spirits or even Gabriel Garcia Marquez' One Hundred Years of Solitude. There was a strong sense of the supernatural weaved into the story as if it's just the way of things, a second plane of reality, that while questioned perhaps, doesn't jolt by virtue of it being magic, but rather shakes things up because of the consequences of it. That's the beauty of magical realism: it throws something not quite normal at you, but you sort of just run with it. You quickly get over the hurdle of the supernatural, accepting is as a part of the reality (because Chloe does). But while the subtle magic holds the eerie plot together, it's the relationship between the sisters that really drives the story and pulls the reader in. Their intense bond serves as the catalyst for the story and in an incredible twist, forces the unexpected resolution. IMAGINARY GIRLS is a fast, but haunting read, beautiful and intense throughout. IMAGINARY GIRLS will be available June 2011. 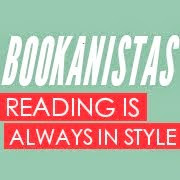 Click here to join The Bookanista Book Club at The Reading Room where you can check out all the books we're buzzing about! I've been mesmerized by imaginary girls since I was about 13, Carolina. Sadly I have to report that it gets no better with age. I am drooling over this book! Beautiful review Carol! I love your reviews, Carol! What a gorgeous cover, and I'm intrigued by your review. Thanks. I'll keep an eye out for this one. I feel like I'm stuck on repeat, a scratched CD, but as always, another lovely, thoughtful review, Carol. You say so much without ever giving anything important away. Yes, this one has a gorgeous cover and has been in my GR's TBR list for a while now. I look forward to reading it. When you compare it to one of my favorites of all time, One Hundred Years of Solitude, well, now I'm really sold. Wow! It sounds amazing! Thanks for the recommendation! Love this cover, too. Magic realism, the bond between sisters, the gorgeous prose of Nova Ren Suma, PLUS your recommendation? This one's going straight to the top of my TBR list! Thanks, Carol! When I was a teenager, my best friend and I wrote notes to each other with so many words, we actually wrote two lines per every college-ruled line on the sheet. Lots of words and stories and made-up stuff. That is what writing is all about, huh? Never enough room to say everything you want to say. So you start writing and hoping that people will read what you wrote and fill in the blanks with their own ideas. This sounds absolutely amazing! I can't wait for June - I've already pre-ordered it! It will be coming in with Possession! That's going to be one awesome week! Wow - sounds like a special kind of book! Wow, Carol. This sounds amazing. I can't wait to read this one. A great review, my dear. Sounds interesting and creepy. I'm in. Great review. I WANT THIS BOOK BAAAAAD. So glad to hear you loved it! Wow, this sound amazing, and what a great review--I think you've really conveyed the feeling of the book. I'm definitely drawn to it. Now starts the long countdown! Thanks for this review, Carol. Sounds like tense and emotional read. Sounds great, Carol! I love books that keep you reading until you have no more steam! Oh that sounds like a great one! Another one to the list ;o) Have a great weekend, Carol! I can just tell from your review that I'm going to love this one too, Carol. I don't think I've heard of it so I'll be putting it on my wishlist for sure! I am so glad that you reviewed this. I just added it to my TBR list last week and wondered how well I would like it when I get to it, but you are making me want to bump it up on my list! Very nice. Thanks. I am REALLY looking forward to this book! Great reveiw! I'm having the same feelings you spoke of as you read the book, I don't want to stop reading because I'm dying to get to the end so I can figure it all out. I've read amost 3/4 of the book and hope to finish it tonight. Great review btw! What did you think of the baloons? Happy Birthday, THE LIAR SOCIETY!